Guinea Pig Advisor > Feeding guinea pigs > Hay, hay, hay! Hay has to be the main food for your cavies and has to be provided fresh at any time. Hay is elemental to keep their gut working on. [Auto translated] Hay is the primary food for your cavies and has to be provided fresh consistently. The first meat at morning should be hay exclusive. Hay is rich in crude fiber / fibre which is essential for the cavies eupepsia. Hay is elemental to keep their gut working on. 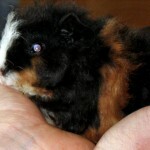 Due to its enormous amount of hey your cavies eat each day (considering to their size, of course!) their digestive system has to work continuous. This is very important because they does not have peristalsis like humans to transport the food so it has to be replenished continuous. 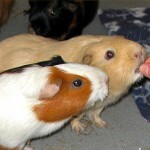 Once one of your cavies stopped eating it is quite difficult to bring the system back hum. So you do your very best to provide fresh hay for your Guinea Pigs permanent! 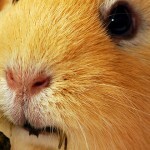 The teeth of Guinea Pigs are growing continuous and has to abrade regularly to prevent malocclusion. Hay is the answer for that problem. By chewing hay the teeth will be abraded as they should be. Did you know: Guinea Pigs chews from back to front and reversed and the normal abrasion of their teeth is about 2mm a week. Please note that pellets and some more inustrial food (which always promise the difference) did not do a good job in abrasion the teeth because cavies does not chew pellets or crackers. So hay is needed for dental health care too! If you are keeping quite more than two Guinea Pigs you know the problem: How to store the mass of hey stable and wisely to keep it fresh? It is simple. Hay has to be stored dark and dry to prevent fungus and moulds and needs oxygen to prevent fermentation. So pack your hay in a dark box of wood or in a duvet cover. Do not store it at the basement or in the garage because it is often to moist there. Also never store in in plastic cans or other airtight bins.